A number of events took place last weekend to remember those killed in the Dublin and Monaghan bombings, and wreathes were laid at the Talbot Street memorial in Dublin and in Monaghan town centre. The ceremonies were held to mark the 40th anniversary of the attacks, which left 33 people and one unborn child dead. The four co-ordinated bombings would be the single deadliest attack in the conflict, and remain the largest attack on Irish soil since the War of Independence. Among the victims were Tomassino Magliocco, who now lives in Italy and whose father Antonio died in a blast on Parnell Street, and Iris Hall, whose father Archie Harper was killed in Monaghan. 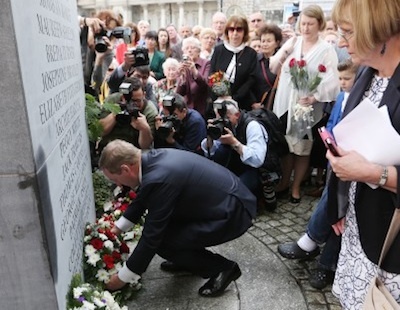 Speaking at the main service, Taoiseach Enda Kenny told survivors of the blasts and relatives of those killed that those who died “will never be forgotten”. Nobody has even been charged with the bombings and there is a dossier of evidence pointing to collusion between unionist paramilitaries and British forces. Families of those who lost their lives are now suing the British government to compel them to release documents about the atrocities. Sinn Fein’s Raymond McCartney called on the British government to release all of the files. He said the hurt felt by the victims over the loss of their loved ones had been made worse by four decades of “cover up and silence” from the British government. “The British government were a party to the conflict and cannot be allowed to shirk its responsibility in dealing with the past,” he said. SDLP leader Alasdair McDonnell also urged the British government to act. “As co-guarantors of the Good Friday Agreement, [they] must take the opportunity of the 40th anniversary to play a full role in bringing the truth to light,” he said. Margaret Urwin, spokeswoman for Justice for the Forgotten, said she hoped action would follow. “The Tanaiste issued a strongly worded statement and restored funding for which we are very grateful. British Direct Ruler Teresa Villiers said she will continue to hold talks with the Dublin government over the bombings, but promised no new action on releasing files. In his sermon the Archbishop of Dublin said great strides towards reconciliation have been made in the 40 years since the bombings. “But we also know that reconciliation will only be lasting when it is based on truth,” he said.